Goodweekend Kit with all the essentials you need ! This week hasn't been really good for me as I got the flu :-( ! However, this little package made me feel a little bit better! It came at the right moment because my skin was all dull looking from the flu. 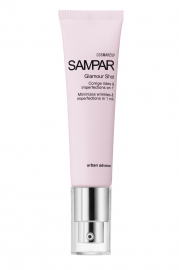 Sampar is a french scincare brand that not only have amazing products, but also the packaging looks 'fashion' ! I've been testing these products for the last few days and I'm really pleased about the results ! 1 ) In the morning and evening I use the 'Equalizing foam peel' , with this product you get rid of all the dirt on your face. 3) because my face looks dull from the flu, the 'Street a peel' product illuminates my skin again ! Perfect ! 4) my favorite product is the 'Glamour shot'. The lovely thing about this product is that you can use it before putting on your powder foundation or after your liquid foundation AND during the day when you feel that your face can use a little boosting ! It instantly minimizes wrinkles and imperfections while matifying the complexion ! Hope you get better soon! Thanks for the introduction!